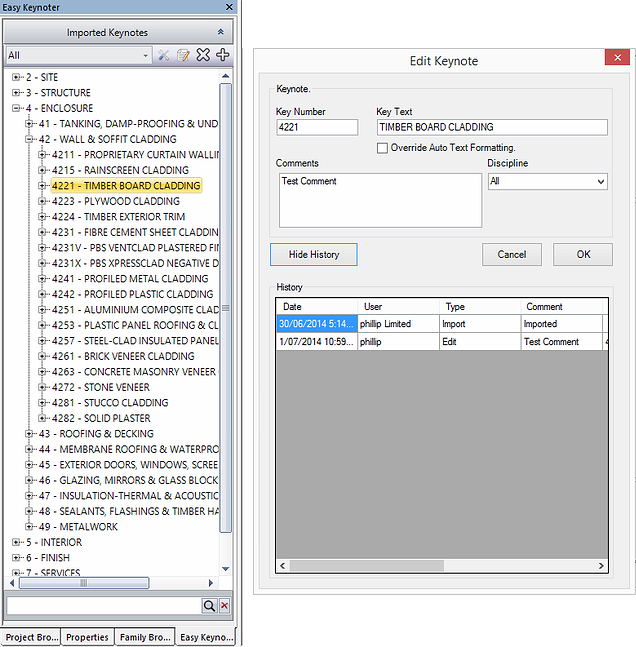 Easy Keynoter for Autodesk Revit 2015 is not just another glorified keynote text file editor. Easy Keynoter can do that plus so much more. All Keynote data stored within a Database. No reliance on Revit reading txt files or the need to have intermediary xml files. This means that there are no issues of multiple users editing the keynotes at the same time as with other systems. Drag and Drop Keynotes from the Palette directly onto Revit Elements to keynote those elements. Super fast search function. Easy keynoter will display all search compliant keynotes in seconds. We have tested this on a keynote file with over 20,000 keynotes and the results displayed within 1 second. Easily Import/Export your existing old Keynote.txt files into and out of the Database. User management. Create user groups and assign who is allowed to add/edit/remove keynotes from the database. There's more information is available on the Kiwi Custom Solutions website.